This entry was posted on September 1, 2013 by admin. Oakland, California (CNN) -- Six-year-old Jayden David violently shakes on the ground, his blue eyes vacant and then filled with searing pain. 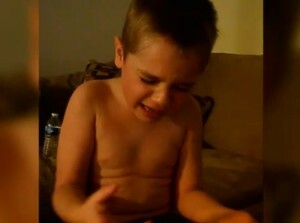 The video shows an unvarnished look at a seizure, something Jayden once experienced routinely. Not anymore, says his father, thanks to medical marijuana. Before he started taking a liquid, nonpsychoactive form of marijuana, Jayden couldn't walk, eat solid food or take a bath. He has Dravet's syndrome, a rare and catastrophic form of childhood epilepsy. It has triggered seizures so frequent that 44 times he has been rushed to the hospital in an ambulance, his distraught father by his side. Jayden's doctors prescribed 22 anti-seizure pills a day, which controlled the seizures but left him immobilized due to the side effects. "He's in pain and suffering and crying," said Jayden's father, Jason David. "You can't help him no matter what. What are you supposed to do? You have to do whatever it takes to save their life." Last year, he had enough. Delirious with fatigue and emotional pain, Jason David called his mother to say he wanted to put a gun to his head, just to end the heartbreak of seeing his son suffer. His mother convinced him to not give up. David turned to something he had seen on television: medical marijuana. On June 4, 2011, David gave his son marijuana. For the first time since Jayden was 4 months old, the boy went through an entire day without a seizure. "Instead of medical marijuana, this is miracle marijuana," said David, holding up a jam jar full of liquefied and cooled cannabis. Jayden is not just walking, he's running. He plays at a park, climbing up and down the steps of the jungle gym. He swims at his local pool, splashing in the water with his father and other children. He loves to go to Fuddruckers to dig into his favorite food, a cheeseburger with mushrooms. His father has begun to wean him off the powerful pharmaceutical pills, which he believes have kept his son from developing properly. The liquid, nonpsychoactive form of marijuana that Jayden takes ensures the boy doesn't get "high." In a laboratory, the marijuana is distilled down to mostly cannabidiols, which advocates say is the potent medicinal value of the drug. Harborside Health Center, a medical marijuana clinic in Oakland, California, helped create the original tincture Jayden took. The center still analyzes and tests the marijuana before David administers it to his son. Harborside says it helps a number of child patients, including Jayden, whose parents legally obtain the marijuana. "Parents don't want to bring their children to something controversial like cannabis," says Harborside's executive director, Steven DeAngelo. "They do it reluctantly, and they do it because they're at their wit's end." Eighteen states have legalized marijuana for medicinal uses or limited personal use. California, which has the nation's largest number of registered users, does not keep demographic data on its registrants. But Colorado has 45 registered users under age 18, Oregon reports 56 child users and Montana has 55. DeAngelo says children with severe autism, epilepsy, ADHD and cancer can be helped by medicinal marijuana. But those sick children, says DeAngelo, often face barriers to accessing marijuana. "What I worry about are the thousands and thousands of children like Jayden who are suffering unnecessarily, who I know we could help," he says. "The only thing separating them from help are outdated rules that need to be changed." Those rules are at the federal level, where marijuana remains illegal. Dr. Seth Ammerman, a pediatrician and specialist in adolescent substance addiction, acknowledges anecdotal reports like Jayden's remarkable turnaround. But he warns that a parent is "flying by the seat of his or her pants" when it comes to treating children with marijuana. "I do think there's potential for these cannabinoids to be medically relevant, but at this time we don't know the risks," says Ammerman. Because marijuana is illegal at the federal level, the government hasn't conducted any thorough research on the possible medicinal benefits. Ammerman is in favor of federal testing, but without it, he says marijuana is too risky to administer to children. "We don't know if these treatments are going to work for every given child, or every given adolescent. There may well be serious side effects." David says he'd pit his son's progress on medical marijuana against any pharmaceutical drug that currently treats Dravet's syndrome. What drives him, he says, is the hope that his boy will one day say, "I love you," something David says a thousand times a day to his son. While we're present, Jayden says something close to "I love you." His father's face lights up. "That's all I want to hear," says David. He hugs his son. "I'm really close."